It’s snowing today in Rhode Island and it’s the third major storm we’ve had in the past two weeks. But on Tuesday, February 27th, in Washington, DC, we enjoyed an absolutely gorgeous preview of what spring will be like in just a few more weeks. 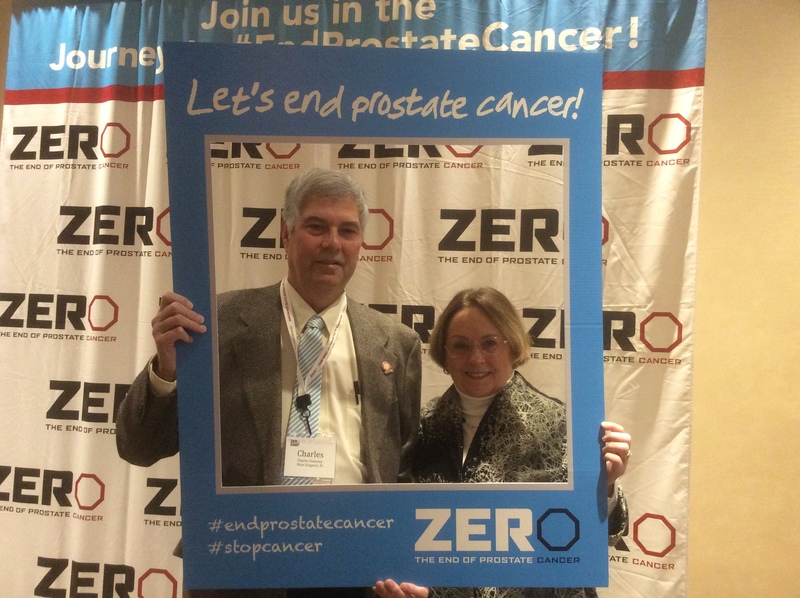 Charley and I flew to our Capital to attend the Zero Prostate Cancer Summit 2018. It was our second Summit and we were already old hands at what we had to accomplish. 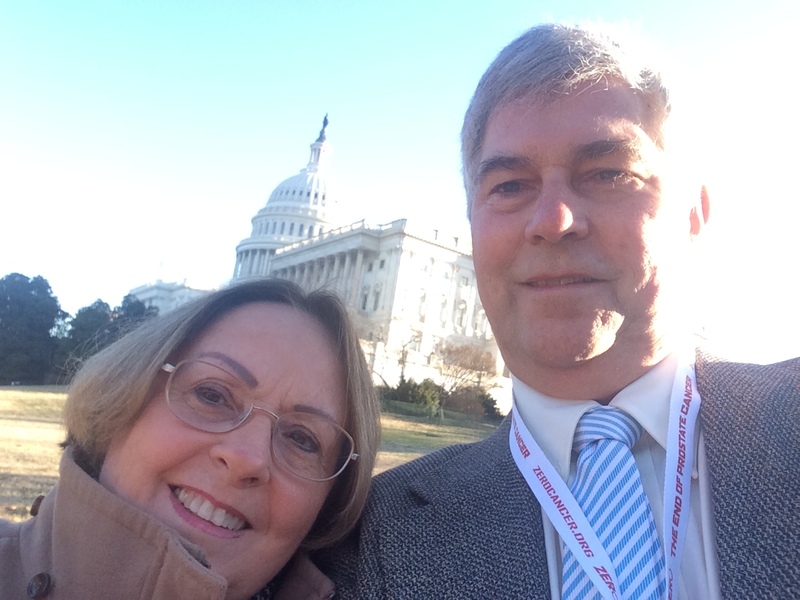 Our ultimate goal was meeting with our Congressmen and Senators to lobby for prostate cancer funding within the Department of Defense’s Prostate Cancer Research Program (PCRP) which is part of the Congressionally Directed Medical Research Programs (CDMRP). Much of our country’s research funding comes through the National Institute for Health (NIH) which focuses on basic research. The money allotted for prostate cancer in the PCRP has a more high-risk, high-reward translational approach. But these monies are discretionary and therefore can be cut from year-to-year. And that is why survivors and advocates from over 40 states take the annual trek to the Hill in the bleak midwinter to meet with our state leaders and their aides to ask for their support. Zero Advocates are well prepared to make our annual “Ask” through the series of workshops and discussions on health and economic issues, policies, innovative treatments and drugs, education initiatives, and personal stories offered in the first two days of the Summit. Experts are brought in to speak. This year Research Highlights, Promising Drug Therapies, Guidelines in Genetic Testing and Counselling, and the Disparities in Prostate Cancer for African-Americans were main topics on Monday. Landi Maduro’s documentary, The Silent Killer: Prostate Cancer in the African-American Community was screened and discussed on Sunday evening. On Tuesday morning, we met early to get our packets and head for the Hill. We were told to dress appropriately which created a dilemma. I had brought along business attire but I was conflicted as to which shoes to wear. And this is where choice could make all the difference, as it is a very long day moving from office to office, building to building. I chose to be stylish and wear my grey, suede dress boots. The comfortable Brooks cross trainers were tucked into the Zero bag just in case. I eventually changed footwear after walking at least a hundred miles and falling only once. (I did not get hurt as I am very well padded.) But I’m still paying for that poor choice as I type this blog. And that is the point of this whole post. We make choices and sometimes they are not the best ones for our health and well-being. Throughout the workshop sessions and discussions, men related their stories; stories they would bring to their Reps. And many stories had a common thread – the need to be educated; the need to be aware of what is available for treatment; the need for resources to help guide patients and loved ones through one of the toughest journeys they’ll ever take together. My husband Charley’s story is all too familiar. He was told during a regular checkup that his Prostate Specific Antigen (PSA) was doubling. My husband’s reaction was, “What is a PSA?” Answer: It is an indicator, a marker, that the proteins associated with prostate cancer are in your system. Too many men are not even aware of how important a blood test for PSA is. And some never even get as far as a doctor’s office. Some do not know their options when diagnosed. And some are given options but choose to do nothing. It is one thing to make a choice when you have all the information necessary. It is another not to have the facts and the resources and the support available which is crucial to making informative decisions; decisions which will ultimately affect quality of life. Choices which could mean the difference between life and death. Charley and I stumbled through those first years. I had done research online. When Charley’s PSA kept rising (at one point it was at 174) after his operation and radiation treatments, his surgeon told him he only had a few years to live. His cancer was aggressive. I told his doctor we did not accept that. I knew of drugs, treatments and clinical studies that were cutting edge. Charley was in his fifties, healthy (except for the cancer), strong, and disciplined. I promised if he were placed in the best studies (no placebos) he would be the first man every cured of advanced prostate cancer. And they agreed. Charley has been through so many studies, each one buying us a little more time. But four years ago he underwent immune therapy using the drug Provenge. Immediately after that, he was placed in a study using Xtandi and Zytiga. And soon after that, his PSA dropped from 24 to under 0.1. The cancerous lymph nodes and then the tumors on his rib cage began to diminish and then, disappear. The bone started to regenerate. He’s been in remission for over three years. This is a five-year study. It entails flying to Baltimore every 28 days to be poked and scanned, to consult with a team and receive the drugs. And it is well worth the travel, the inconvenience, the discomfort, the cost. He is alive, healthy and well. We cherish every moment we’ve been given. And this is where Zero comes in. We navigated these waters together. We were alone for many years and then a nurse connected us with the Zero Prostate Organization. They helped to defray some of the costs. These drugs are expensive. In the United States, Xtandi is $7,400.00 a month and Zytiga is $8,200.00. And the only reason these drugs were even discovered is because of the innovative research financed by PCRP. But the most valuable resource Zero provides is an opportunity to bond and a place of fellowship for men who understand what it is to be given this diagnosis. Zero saved Charley’s life and when we finally get to the study which will result in a cure, they will have saved thousands of lives to follow. We will see the first Generation 0 – the first generation of men without prostate cancer. And when there is a cure for prostate cancer, other cancer cures will follow. Making the right choices is critical on so many levels. I’ll soon get over having aching feet. But the work done by organizations like Zero Prostate Cancer is crucial in helping men make the right choice – one which will give them more quality time with the people they love. The people who cherish them. Please share this website with someone who may be going through this journey. It can make all the difference in the world . It already has. Thanks to you and Charley, Clare, for sharing your story and for spreading the word about prostate cancer treatment, options, and resources. It may save lives! You’re welcome, Donna, It has become an important part of our lives. And it’s empowering for someone with cancer to be able to help others. Charley is the best patient ever. What an inspiring story! Thank you for sharing it. 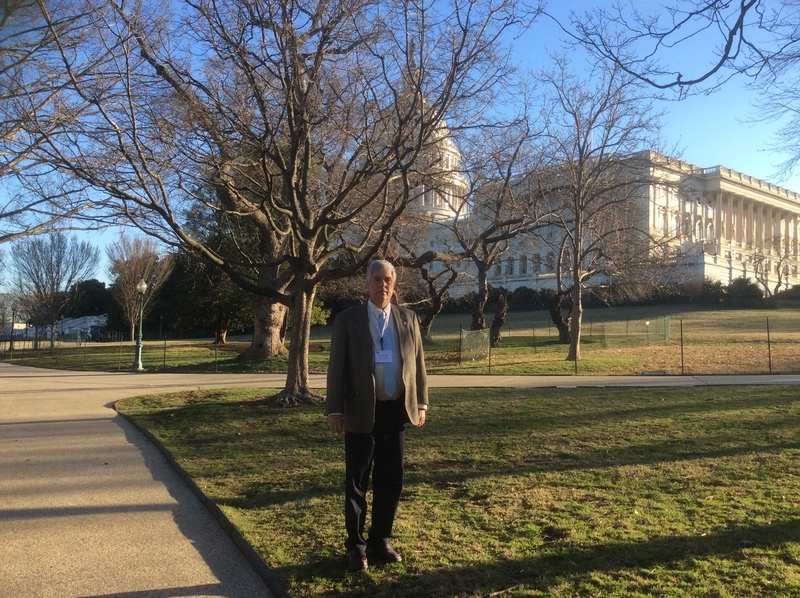 Lobbying for a good cause is a real vocation. My daughter lives in a suburb of Washington, DC, where many employees of NIH live. This has been a bad year for them. Funding has been cut, and some talented researchers have lost their jobs or are in danger of losing them. It seems very short-sighted to cut funds for research which can benefit so many people. I have such a difficult time understanding putting more money in the budget for weapons and less money for health issues. But I certainly have come to understand large pharma companies and their influence on government funding choices. If you know someone with a diagnosis of prostate cancer please read this and share it with him. What a fantastic outcome. People are often reluctant to assert their rights for treatment. Thank God you did. Yes, we have to learn to stand up for our rights. Actually, we are finding that the young people are showing us the way at this point in time. I hope people take a few messages from this post and one important message is that everyone deserves the best medical care available; it is not a matter of who can afford it. So true – all of that !! Thank you for sharing yours and Charley’s story. I hope he continues to thrive, so that you can both carry on spreading the word. Hi Clare. Yes thanks, it finally has although parts of the country are forecast to have some more this weekend. Not here though, thankfully. You’ve reminded me that it has been a while since I’ve written something new about mental health – I’ve been recycling instead! I have a friend with prostate cancer so I know where you’re coming from on this – as I said, I hope Charley continues to do well. It’s sad that governments don’t seem to prioritise the right things – it happens here too, and research funding is often woefully short of what is required. Take care, my friend. We are walking the same road as you Clare, but here in Spain we were lucky they caught it early and are now waiting for the radiation or brachytherapy appointments – and thank God, her it is all free or we wouldn’t be able to afford it all. Lucinda, Charley and I wish you the best in your journey and can offer encouragement that there is light at the end of the road. Please feel free to have your husband contact Charley any time. c.sweeney.93@yahoo.com. I love that you fought for life. Great post. I had cancer so I get it. My husband went along to appointments because I would get so overwhelmed I didn’t hear or remember things clearly (and I don’t have mental deficits). No one should go alone. My brother had prostate cancer but a less aggressive form. He had radiation about 40 years ago and has been doing well. I would love to see more breakthroughs in cancer research. A break through on one form can affect other types too. Ah, that’s so kind but he’ll probably kill me for making it this public. He was so shy after his first biopsy and only by chance talking to a girlfriend – her husband had the same problem – could I get him to open up. He’s better now and his friends in the walking group are going to take turns ferrying him to and fro for sessions if he has to go 5 x a week for 5 weeks – the nearest centre is 50km. Yes, Charley was the same. You could tell it was almost too much for him to process. It is so great to be with the Zero group when the guys get started. They have formed a real brotherhood and talk to each other – and they laugh a lot. It’s wonderful to hear that sound in a room of survivors. That’s why it’s good for your husband to have other men he can talk to. Charley is always available to listen. I will share this with my friend who has stage IV cancer. You give us all great hope. Dear Ethel, Congrats to Charley for beating the nasty C word!! I know he couldn’t have done it without you! Excellent choice to bring the tennies!! I’m all about comfort, myself! Thank y’all for your tireless advocating! Excellent, informative article. I’m passing it along to friends. And yay for Charley and both of you for not giving up, but fighting for the best medical care you can find. I hope it can help someone find the resources needed. All I can do, my Friend, is admire your and your husband’s great courage, and to wish you the “wellest.” God love you. Osyth, thank you for this lovely message. Charley and I try to keep ourselves busy, just as you and your hubby do. I hope we are together forever and wish you the same. Love, your friend across the pond. Clare, thank you and Charley for sharing the mission of Zero. You two are sharing your fortune forward, the very best dividend on the investment made on fighting for Charley’s health. Everyone benefits from your personal mission to share and promote information about prostate cancer. I’m wishing both of you much good health. This is really wonderful news, for you and for everyone. Thank you again for all you’ve done to campaign for funding. Clare this is such a hope filled post for all who read it. I’m so glad for you and Charlie. Your determination to do whatever it takes is an inspiration. I sympathise about the feet. Some choices have no logic 😋no obvious logic anyway unless you’re a woman. Thank you, Jess. The cure is closer than we think. Can I pm you Claremary? I’d like to ask your advice I’d prefer not to add here. Hi, Lucinda. I’m just checking into my comments, now. I turned off personal messenger because ogf attempts to hack in. My email is claremarysweeney@gmail.com. Clare the email bounced. I did a cut and paste so it should have been right. Hi, Lucinda. Send an email to claremarysweeney@gmail.com and I’ll get right back to you.